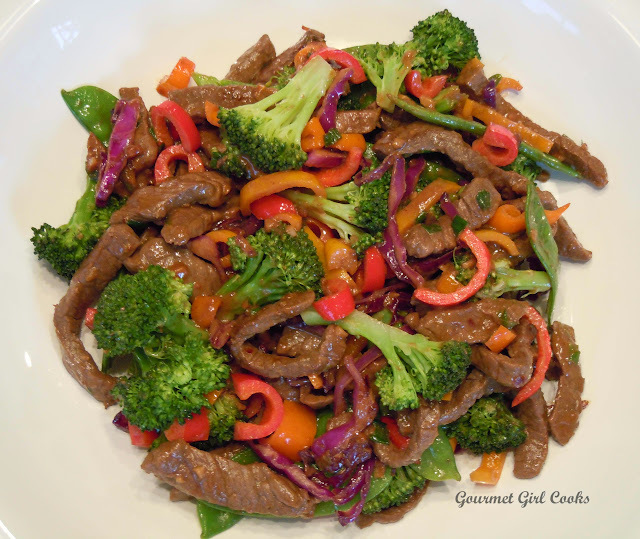 Gourmet Girl Cooks: Oh My...It's Beef & Veggie Stir-fry! This evening I was in the mood for "Chinese". I stopped at the store on the way home to pick up some beef to make a stir-fry with. 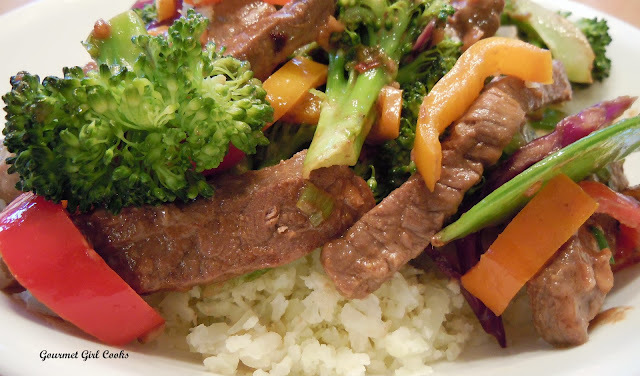 I found a beautiful 1-pound package of top round steak that was already sliced for stir-fry. I normally like to cut my own steak, but this package of meat was unusually beautiful so I bought it, and in doing so, saved myself a step. I love lots of different veggies in my stir-fries. I cut up about 2 cups of fresh broccoli florets and steamed those for 3 minutes in a few tablespoons of water (covered) in the microwave. I added a handful of fresh snow peas on top of the steamed broccoli, covered them, and steamed an additional minute in the microwave. I sliced 3 mini peppers; red, yellow and orange and 2 green spring onions. I added thinly sliced red cabbage to add some crunch and color. I minced 2 large cloves of garlic to add flavor to the dish. To cook, I heated a couple tablespoons of extra virgin coconut oil on medium high heat in my wok and added a couple pinches of red pepper flakes and the beef and stir-fried just until the meat was no longer pink. I used a large spoon and spooned the juices off into a bowl as the meat cooked it would sear nicely (not simmer in its own juices). I spooned about 1/2 cup of beef juices off into my bowl and set it aside to use to make the sauce later. I transferred the cooked beef to a plate and then added the minced garlic to the hot wok with another pinch of red pepper flakes and stir-fried for a minute or so, then added half of the sliced green onions, all of the peppers, red cabbage and stir-fried them for a few minutes until crisp tender. 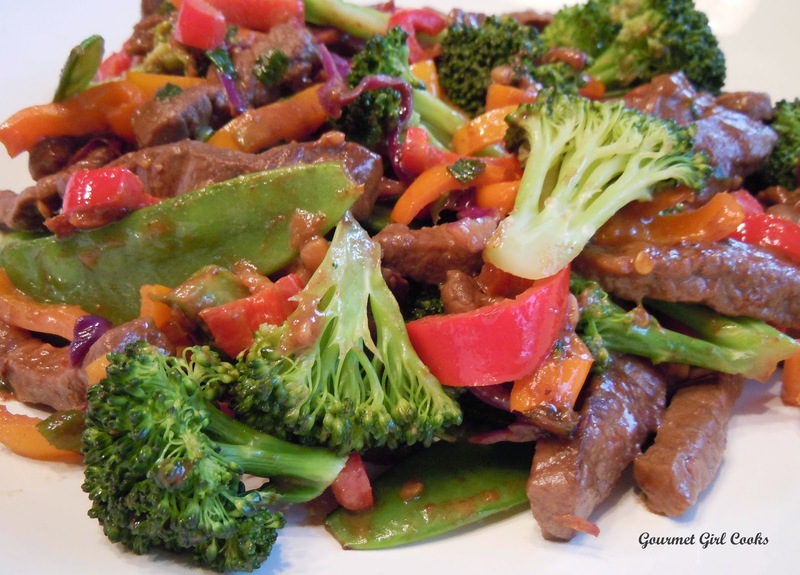 I then transferred the cooked veggies and placed on top of the beef so I could make a quick and simple sauce. I poured the beef juices back into my wok and added about 3 tablespoons of organic Tamari sauce (which is basically a wheat free soy sauce), a few grinds of sea salt, another pinch of red pepper flakes, 1 teaspoon sesame oil and then stirred in a heaping tablespoon of organic peanut butter to use as a thickener for the sauce. It doesn't take much and it gives you the same texture/consistency that you would normally get if you used traditional cornstarch to thicken the sauce. I tasted the sauce and adjusted it for seasoning. 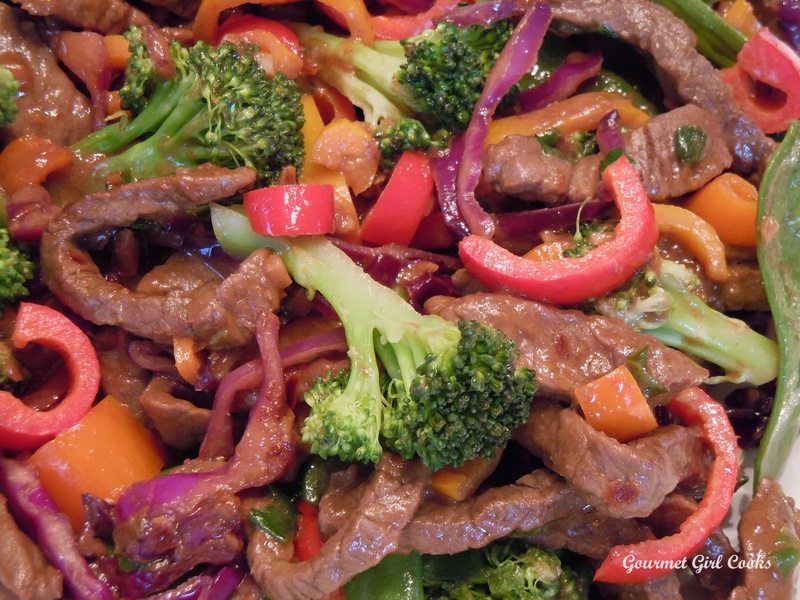 This made just enough sauce to glaze and coat the stir-fry, so it is important to make the sauce flavorful. If you like more sauce you can add more beef broth. I made do with what came out of the beef as it cooked, because I prefer it coated, not swimming in sauce. I added in the beef along with the stir-fried veggies, the drained steamed broccoli and snow peas and tossed everything together to coat with the sauce. I served mine over a bed of steamed cauliflower rice (fresh cauliflower that I grated on a regular box-type grater and then steamed in the microwave for 3 minutes). I don't add any water to the cauliflower rice when I steam it, and it comes out perfect. I snapped a few photos for you to see below. Enjoy! What a lovely Anniversary meal! I agree about the sauce ... I like the stir-fry just glazed, rather than drowning, so I wouldn't be adding additional broth to this dish, either! I made a version of this tonight, without the beef, as a veggie side dish to go with our wonderful Costco grilled lamb chops. The stir-fry was great. Since I’ve been reading your blog, I’ve been learning to be more free about mixing-and-matching ingredients according to what I have on hand. First of all, my wok is packed up "somewhere" so I used a skillet. I had some coconut aminos so I used that instead of the Tamari. I also didn't have cashew butter so I used almond butter ... very yummy! I used sauteed mushrooms, onions, and garlic (in butter) and the microwaved broccoli with some carrot slices thrown in for color. I picked up the beef stock the other day, but didn't want to open it for just 1/2 cup, so I used the veggie cooking water + a little plain H2O to make 1/2 cup. With all the various seasonings (especially the sesame oil!) it was very tasty, indeed! Next time I want to make it with the cabbage, snow peas, and the cashew butter. Our Costco has been *out* of almond butter. Guess I'll be forgoing the Almond Flax Bread for a little while. Better buy a *couple* of jars when (or if) they get it again!